Picture show Legislator Chanka Maharaj, Mr. Renison and Mrs Renison, It is upon Chanka Maharaj lands that the El Socorro Islamia School was built. 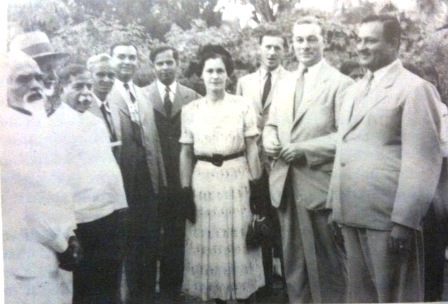 Picture taken at the formal opening of the school in 1949. Principal and competing students recall the moment. “Four months after the school was started, an event of particular significance occurred. For the first time we entered a Quiz Competition among the schools of the St. George area. The competition was being held at the San Juan Government School, and, in those days, these competitions drew large attendances comprising parents, teachers, pupils and members of the public. The competition was based on Civics. The trophy at stake was a cup donated by the then mayor of Port of Spain, the late George Cabral. I remembered that there was one particular school which had the reputation for about :three years to cop this trophy. Our school was represented by two cousins – Majeed Mustapha and Raffina Mustapha. Since we were entering our first competition, we took great pains to prepare those two pupils. But how could we succeed in a.competition with such seasoned competitors! After all we were just four months old. I realized this was a great disadvantage to us but as the saying goes, there could be a dark horse in the race and sometimes there are upsets. I REMEMBER attending the Barataria E.C. School – it was the ‘big school’ and it was very far away. Then, one day, mi father told me that I had to attend the El Socorro Islarnia Private School on Bissessar Street (1942). What a change of environment! The El Socorro Islamia Private School was a tiny, one- room school with a few pupils. The headmaster was an old retired person – Mr. Henry. He was the typical Headmaster – very strict but a true gentleman a good person. These were hard days and we went to school under difficult conditions. World War II was on everybody’s mind but I remember my father and some of his friends visiting various mosques in the country, every Friday after Juma and their sole purpose was to collect donations to pay the teachers of the El Socorro Islamia Private School. When in 1949, our School was granted State-Aid, everything changed and everything seemed so different and much more exciting. 1 remember our new headmaster, Mr. Nabab Ali. He was a very charismatic and energetic person, full of excellent ideas and willing to do anything to make our new school a success. I REMEMBER the formal opening of the school (September 1949) when we were all dressed in green and white tunic outfits and had to sing and perform a folk dance to the tune of ‘WATTAN KEYA’. The then Governor General, Mr. Renison and his wife inspected a Guard of Honour. I REMEMBER how excited we were on Fridays, when we had House League Competition Results. Mr. Nabab would relay the results in an exciting manner as though he was broadcasting a race for a radio or television station. The highlight of my memories at the El Socorro T.I.A. School, puts me in the company of my cousin Majeed as we teamed up to represent our school at the St. George Primary Schools Quiz Contest. Against all odds, our school won and at that time, I remember feeling a deep sense of pride and honour after winning something for my friends and school. I REMEMBER, too, Mr. Rajkumar who coached us for the Quiz Contest. He was a teacher from Barataria E.C. School who came and taught our Exhibition Class. He was a great teacher, very loyal and a dedicated person. He went on to become principal of the Aranguez TIA School and during that time, Mr. Rajkumar helped me to get my first teaching job. I REMEMBER all these things that occurred 50 years ago. These memories are still with me because we were part of a great moment in our history. INSHALLAH, I will forever remember my days at the El Socorro Islamia TIA School. Extracted from Tackveeyatul Islamic Association of Trinidad and Tobago Inc – Silver Anniversary souvenir brochure, published in 1974. Fifty years ago a few bright-eyed students registered at the El Socorro Islamia School and the most immediate difference was – we were saying ‘AsSALAAM-U-ALAIKUM’ instead of ‘Good Morning’ and our prayers were Sura Fatiha instead of the Lord’s Prayer. These changes had a profound and indelible impact on everyone – students, teachers and parents. Oh ! What a feeling of pride that was! An important and memorable part of the transformation was the first head teacher, the late Mr.Nabab Ali and his entire staff. They all had tremendous zeal and dedication. They were greatly motivated and enthused by the Islamia ’cause’. As a consequence, they succeeded in motivating all the students to dedicate their efforts to the pursuit of educational successes. For most of the early students, this was our first opportunity to learn about Islam while obtaining a sound general education. 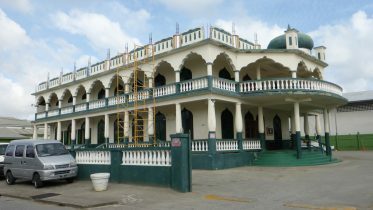 Although resources were limited or non-existent, it did not seem to matter to anyone at El Socorro Islamia School, after all, we were on a mission – to change history and at the same time to become better citizens of Trinidad and Tobago. Does it matter if in the first football game against an established school, the El Socorro Islamia School was demolished 14-0? We showed up for our first cricket match at Barataria Oval, but we had no batting pads nor gloves. Their players seemed so much older and bigger – again we were soundly beaten. Then in our first year of existence, we meekly entered our first Quiz Contest against all the other schools m East St George. El Socorro Islamia was not given much chance but my cousin Raffina and myself representing the underdogs, El Socorro Islamia, shocked the experts by capturing the trophy as the best. Mr.Nabab was very pleased. Our school mates were pleased. Raffina and I were overwhelmed with joy and happiness. This was just the start of the Islamia School. Over the past fifty years, the five Islamia schools have continued with the tradition of academic excellence while providing sound Islamic teachings. It is with great pride that we can all look back at the fifty years and be ever thankful to Maulana Nazeer Ahamad Seemab and the many other pioneers who worked tirelessly for the creation of the Islamia school. History has proven that they were men of great knowledge and fore sight. They have changed the history of Trinidad and Tobago and we must thank Allah for guiding these men, so that today, we can celebrate the 50th. Anniversary of my old School – El Socorro Islamia. Ameen ! Be the first to comment on "Monumental pride – Trinidad’s first non-Christian school 4 months old won 1949 regional quiz competition"